Smoothies can be a controversial snack for little ones. Why? The reality is that many smoothies are often packed fruit sugars. While the sugars that come from fruit are natural, as with anything, there is such a thing as too much— especially when it’s displacing other nutrients. 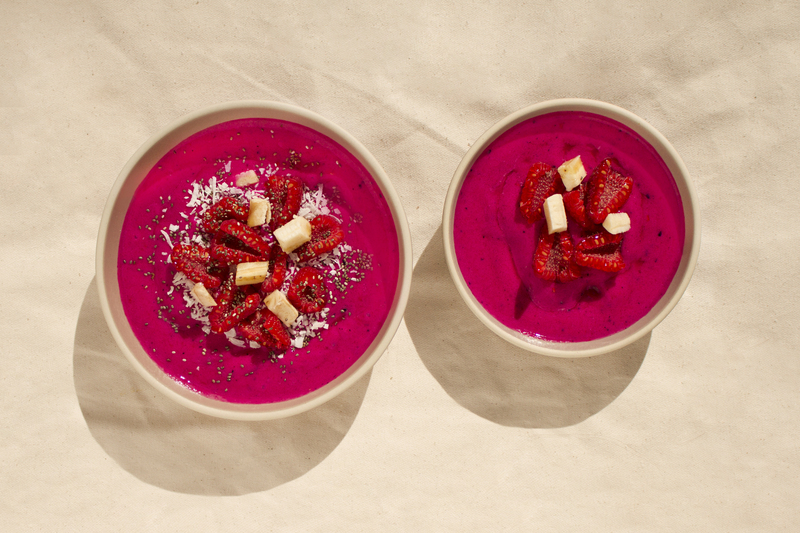 This is why we created this Dreamy Pitaya Smoothie— and it’s truly delectable. In order to keep sugar levels low, we’ve added in steamed cauliflower that’s been frozen. This is an amazing addition to smoothies when you want to keep them low in sugar. I always steam large batches of cauliflower and keep the steamed florets in the freezer so I can add them to smoothies anytime. Cauliflower is also high in fiber, vitamin C, vitamin K, vitamin B6, folate, pantothenic acid, potassium and manganese. Adding it into your smoothie is a no-brainer. Pitaya is naturally low in sugar, and adds gorgeous color to this bowl— and, it’s rich in antioxidants, B vitamins, and vitamin C. Banana adds fiber and potassium and pineapple is a rich source of vitamin C and manganese. Raspberries add in some antioxidants, vitamin C, manganese, copper and fiber. We’ve also added baobab powder— which comes from the fruit of Africa’s ‘Tree of Life,’ and is a rich source of vitamin C. Baobab promotes regular energy release, immune function, and contributes to healthy, glowing skin. Unsweetened almond milk, if your baby is all clear on nut milks, is the perfect way to blend it all together— but feel free to sub any other liquid of choice, such as coconut milk, cashew milk, hemp milk or oat milk. For yourself, you can also add chopped fruit, almond butter, shredded coconut, chia seeds, flax seeds, or whatever else you have on hand. Baby can eat the smoothie out of a bowl with a spoon, or you can pop it into a sippy cup or a small plastic cup. We guarantee you and baby will love it! A dreamy smoothie packed with all the goods and not-too-much sugar. Featuring banana, pitaya, frozen steamed cauliflower, raspberries, pineapple, Baobab powder and almond milk.